The maestro of modern Calcedonia Art Dino Rosin was born in Venice on May 30th 1948. The child was destined to continue the tradition of the great Murano glass art. So, when he was just two months old, the family shifted to Murano, the glass blowing capital of the world. The boy Dino left school for good, when he was 12 years old to follow his interest. At first he joined the then famous glass blowing furnace of Barovier and Toso as an apprentice. Then in 1963 he left the furnace to join his brothers Loredano and Mirko. There he learned his basic lessons in Calcedonia work. I n 1975 when his brother Loredano Rosin established his own studio, Dino joined him and worked with him for 25 years. Even when he worked with his elder brother, who was a master in the art, Dino maintained his own style and was able to demonstrate incredible creative brilliance in the art. Instead of being eclipsed by the artistic style of his brother, Dino emerged as an outstanding artisan in his own right. When his brother Loredano Rosin met with an untimely death in a boating mishap, Dino Rosin continued with the tradition and art. 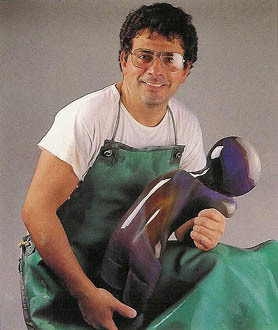 It was Dino Rosin’s style to integrate the traditional Murano art with the contemporary ideas. The innovative genius of the artist is evident in each one of his creations. In 1988 Loredano and Dino Rosin were invited to Pilchuk glass school of Washington to teach solid freehand glass sculpture. There they worked with the American sculptor William Morris. After the death of his brother in 1991, Dino Rosin continued to visit America for exhibitions and demonstrations, during the last two decades. 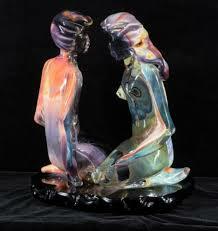 Dino Rosin Arte studio now continues to produce quality handmade solid glass sculptures. The calcedonia style was reinvented and perfected by the brothers admirably. 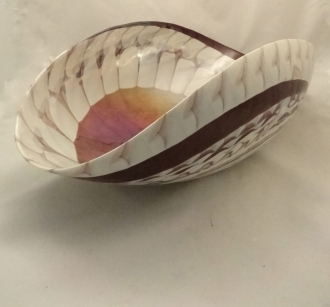 Calcedonia glass art was first evolved by the traditional Murano glass artisans in about 1460. The spectrum of colors and the i ncredible and unexpected striations formed by the technique held the world in awe. This was achieved by the artists by adding Silver Nitrate to clear molten glass. However, the striations and color combinations cannot be controlled by the craftsman himself. It depended on the metals used, the temperature of the furnace and the length of time the glass was exposed to these temperatures. The result is that there will be no two exactly similar calcedonia art pieces. Thereafter, the technique was lost and reinvented two times in history, before the Rosins. It was reinvented once again by the Rosin brothers in the 20th century. A Dino Rosin art piece is very distinguishable by its sheer beauty. His work exhibits a unique and ethereal fluidity of colors. The art pieces are incredibly light-weight also. Dino Rosin sculptures are marked by their rich array of colors and a characteristic elegance. The materials used are of high quality. 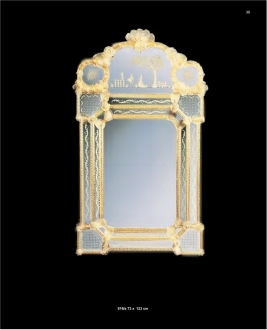 The simplicity and excellence of workmanship of the Maestro’s work has earned him an excellent place in the art world. All the art pieces produced by the Dino Rosin studio are signed by the maestro. In his own words, he unceasingly tries to introduce innovations in every new batch of sculptures. While the collections are renewed every year, the traditional style is not compromised. They are still handmade art pieces. They still reveal the artist’s expertise in forming and sculpturing of glass. 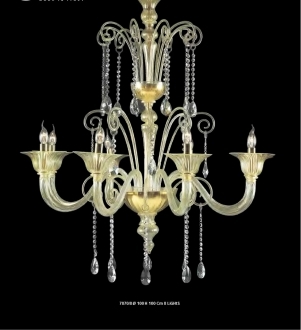 He has spent all his life in perfecting the age-old tradition of Murano.